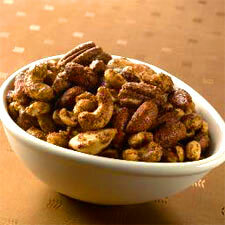 This is Rachael Ray’s recipe for spiced nuts, taken from Food Network which hosts her show. If you’re making this in bulk buy nuts from the market. Toast nuts in a pan. This usually takes 7 minutes but use your nose as your judge. Transfer to a plate when done. Then, melt butter in the pan, adding your spices. Pour back the nuts. You’re done!